For the past several years, California real estate mogul Ed Roski has held the keys to a highly-developed stadium concept in the city of Industry, CA - just twenty or so miles east of downtown Los Angeles. Keen to build the $800 million stadium - without guarantees of an NFL team even moving there - Roski's plan has hovered above those NFL teams with ideas of relocation or, at least, leveraging the possibility of relocation into new taxpayer-funded facilities (see: Buffalo, Minnesota, Jacksonville, St. Louis). The sprawling Industry, CA stadium plan is already popular. In just the past few days, however, Roski's monopoly on a Los Angeles-area football stadium plan has dissolved. Although Roski possesses the only "cleared to build" stadium permit for the LA area, there are now rumors that the Anschutz Entertainment Group (AEG) is looking to build a billion-dollar retractible roof stadium in downtown Los Angeles. Led by LA businessmen Casey Wasserman and AEG CEO - and Roski's former business partner - Tim Leiweke, the new facility would be built directly adjacent to the Staples Center, in the heart of AEG's redeveloped sports entertainment district, LA Live. Since there is only room for one LA-area stadium project, these two bids could go up against each other mighty soon. Even though Roski is much farther ahead in terms of a time frame, the downtown project could get the upper-hand because, with a roof, it could host Final Fours, Super Bowls, Pro Bowls, the NFL Draft, the NFL scouting combine, boxing matches, potential World Cup games in 2022, and a host of other high-profile events. And, all things being equal, according to industry insiders, the NFL would prefer the downtown option. 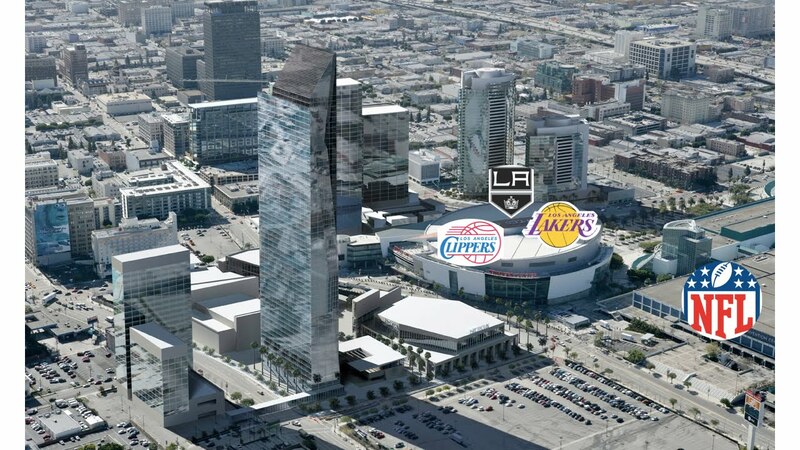 if a new NFL stadium is built adjacent to the Staples Center. So, which team is most likely to consider the LA option? According to SportsByBrooks, that team is the San Diego Chargers. 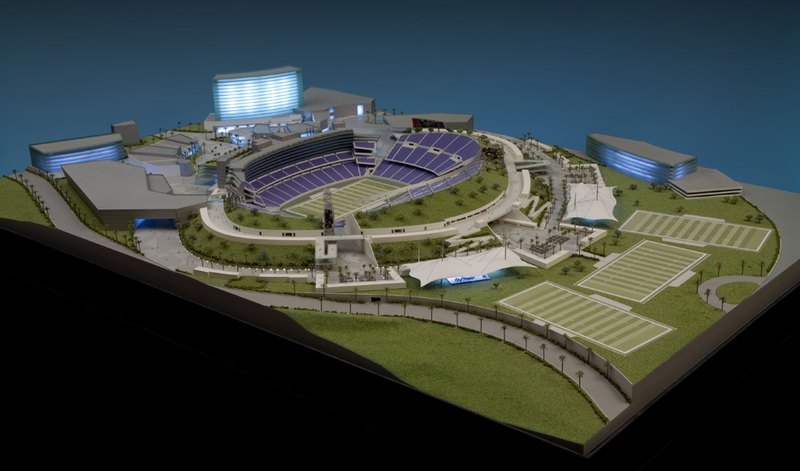 With Qualcomm Stadium aging (and - according to some - in a state of obsolescence given contemporary NFL stadiums) and a battle to procure public funding for a new stadium looming, could the Chargers be that desperate? Or is this just another means of providing leverage for owner Alex Spanos? One other significant connection to the potential downtown stadium includes Stan Kroenke, a member of the Los Angeles Stadium Working Group committee, and current owner of 40% of the St. Louis Rams. Kroenke, who is privy to all the details of building a stadium in the Los Angeles area, is also trying to obtain full ownership rights to the St. Louis Rams (after he exercised his right-for-refusal over an outside bid to buy the Rams. An outside bid, mind you, that Kroenke demanded pay him a fee of between $50-$100 million to, simply, get out of the way). This move to purchase the Rams outright is currently being blocked by the NFL, who prohibits their owners from owning teams - albeit in different leagues - in competing markets. 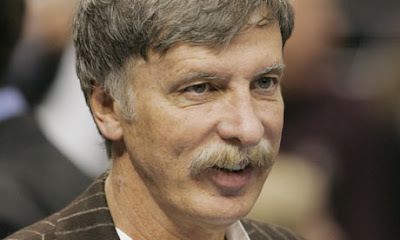 In addition to his 40% stake in the NFL's Rams, Kroenke owns principal stakes in the Colorado Avalanche (NHL), the Denver Nuggets (NBA), and the Colorado Rapids (MLS). All reports suggest that NFL commissioner Roger Goodell will eventually prohibit Kroenke from 100% ownership of the Rams. This man, and his mustache, could be moving the Rams back to Los Angeles. An interesting connection especially given the upcoming NFL draft, where the St. Louis Rams have the first pick. Could Kroenke be setting the stage for a move to Los Angeles in the near future? Probably won't get mentioned on the ESPN telecast, as the network looks to add some glitz and glamor to the event, broadcasting it in prime time on Thursday night for the first time ever. In fact, the NFL and ESPN have put in extra work to ensure that this Thursday's event is the most glamourous in the entire 30-year televised history of the NFL draft. Not only will both networks televise red-carpet pre-shows outside of Radio City Music Hall, but as ESPN producer Jay Rothman states, "there's a strong effort by the league to have more glam." The sentiment was echoed by NFL network producer Eric Weinberger, who said "It's up to the NFL, NFLN, and ESPN to make it more of an awards show, a huge entertainment atmosphere." According to one NFL executive, "We started meeting earlier than ever before...to try and build the biggest draft of all time." First, what does that mean and second, do we really need more "glam" in the NFL draft? To answer the former, there will be more celebrities on the show (Whoopi, Alyssa Milano), former NFL players announcing late-round picks (featuring the Jaguars' Tony Boselli and the Giants' Mark Bavaro), a more "conscious effort to concentrate on that moment when [draftees] are picked, and crying and hugging their families," cameras in prospects' homes and NFL "war rooms," etc. As for the latter, I can't make much sense out of piling more "glam" into such an anti-climactic event. But with all the emphasis on spectacle and star power, perhaps it's just the latest example of the NFL's increasing attempts to create "event television" (see: Miami Pro Bowl before the Super Bowl, the last five years of the NFL combine). Which, to me, makes it only a matter of time before an NFL team returns to the ultimate home of glitz and glam - the nexus of celebrity and spectacle - Los Angeles, California. The only question left: which team will it be?